Clark School Dean Nariman Farvardin (ECE/ISR) has received a patent for research in collaboration with Mitsubishi Electric Corp.
Farvardin and Eiji Atsumi of Kamakura, Japan, have developed a method and apparatus for compressing and decompressing images. Specifically, the method allows for the selection of a region of interest in an image, which is then given priority in the encoding process. This can result in increasing the speed and/or increasing the fidelity of the reconstructed region of interest. The system enables more effective reconstruction of digital images over communication lines. This technology could be incorporated into a digital camera. A user of the digital camera could select a region of interest on a viewfinder or display of the camera. The camera then would record the information in the region of interest only. By only recording a selected region of interest with a high resolution or fidelity, the amount of storage space required to store the digital image may be reduced. The inventors were issued U.S. Patent No. 7,221,804 on May 22. The patent has been assigned to Mitsubishi Electric Corp. and the University of Maryland. 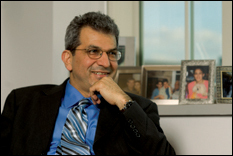 Farvardin will become provost at the University of Maryland this summer.